Gray Brechin delivering a talk. April 26, 2018 "SFMOMA Public Knowledge Talk: Reimagining the City "
September 7, 2016 “Recovering from the Depression: The Enormous and Invisible Legacy of New Deal Public Works in Sonoma County and Beyond"
October 27, 2015 “Living New Deal"
The Grand Design: PPIE and the “City Within A City” - Panel discussion moderated by Laura A. Ackley, author of San Francisco’s Jewel City: The Pan Pacific Exposition of 1915, with Gray Brechin, Kerry Laitala, Therese Poletti and Christopher VerPlanck . July 19, 2015 "Building Bridges and Labor Maritime History Boat Tour"
Join LaborFest again this year when the ILWU-IBU/MMP crew takes us out on the bay to enjoy the beauty of the San Francisco Bay. We will learn about the San Francisco General Strike, Maritime Strike, how unions built the bridges and how they keep the bay clean. We honor the workers who built the bridges. Labor process photographer Joseph Blum will talk about the building of the new Eastern Span of the Bay Bridge. Gray Brechin and Harvey Smith will talk about the history of the WPA and how it has shaped the Bay Area. There will be speakers about ongoing union struggles for worker rights and what we can do to support these workers. We will also have labor music from the US and around the world including Chinese migrant workers musicians. You can’t afford to miss this great time on the bay. Boat leaves promptly at 6:00 pm. Please arrive 30 minutes before the departure time. Tour lasts 3 hours. A complimentary meal will be provided, however, if you are on a special diet, please bring your own food. We will contact you to confirm your reservation. Then, you should mail a check ($45/person, children under 6 - free, 6 to 12 $25) to LaborFest, P.O.Box 40983, San Francisco, CA 94140. We don’t send out tickets, but we will either e-mail or call you back to let you know that we received your check, and as soon as we receive your check, your reservation will be confirmed. You will get your ticket at the pier before you get on the boat. We will be gathering to the left of Pier 39, toward Pier 41 (Blue & Gold Fleet). Please be there at least 30 minutes before departure time in order to go through paper work. We expect the tickets to be sold out quickly, so please make your reservation early. July 13, 2015 "A Victory in the Fight to Save Our Historic Post Offices"
Citizens to Save the Berkeley Post Office fought for their historic building and art for three years. They made the nation aware of the issue with articles in the New York Times, theWashington Post, the Los Angeles Times and the San Francisco Chronicle. July 12, 2015 "New Deal Bus Tour for LaborFest"
Join Gray Brechin and Harvey Smith as they travel through history on a bus tour of sites built by the New Deal’s “alphabet soup” agencies. You will learn about the major contribution government-paid workers made during the depression era New Deal programs. Gray and Harvey will discuss the art, architecture and social programs that effectively dealt with the period’s economic meltdown in contrast with today’s response. Please be aware that the tour will take about 5 hours depending on the traffic and the discussions. Meet in front of Bill Graham Auditorium, between City Hall and the Main Library (99 Grove, SF Civic Center). Please bring your own lunch. For those who can’t bring one, we will have sandwiches and drinks on the bus for a small cost. Bus will return to Civic Center. Tour lasts about 5 hours. October 16, 2014 “Recovering from Depression: The New Deal’s Contributions to San Francisco"
August 17, 2014 “That Morning in the Far West: The Reverend Joseph Worcester's Bay Area Circle presented by Dr. Gray Brechin"
History Forum, CSU Bakersfield, 3:30 p.m. – 5:00 p.m.
Dr. Gray Brechin will delve into the history of San Francisco’s Depression-era architecture and public art, including iconic places such as Coit Tower, the Mother’s Building, and Aquatic Park. Presented in partnership with the Living New Deal. The major key of the Anglo conquest of the West was a reckless conversion of its natural resources into legendary fortunes, but a few envisioned possibilities in its landscape and climate for intellectual and spiritual expansion available nowhere else. Chief among them was Swedenborgian minister Joseph Worcester whose charismatic personality attracted a circle of designers whose creations continue to influence thought and lifestyle in California long after Worcester's death. Dr. Gray Brechin is a historical geographer and author of the popular book on urban studies, Imperial San Francisco: Urban Power, Earthly Ruin. Closely associated with the University of California at Berkeley for the past forty years, he currently serves as a visiting scholar in the department of geography and project scholar of California's Living New Deal. Februrary 12, 2014 "The Two Hearst Plans for U.C." Focusing on New Deal work in and around Long Beach. Start at Double Play Restaurant, 16th & Bryant Streets. Conference: 1935: The Reality and the Promise. Hofstra Cultural Center, Hofstra University, Hempstead, New York. San Francisco History Association, St. Philip's Church, 725 Diamond Street, San Francisco. The Mendocino Coast: An Eco-Communitarian Conference, at the Caspar Community Center, Caspar, California. Nevada City, California — Mr. Brechin will speak during the first-ever public conference on how to address the ongoing human health, environmental and cultural impacts of over a century of mining in the Sierra Nevada. Franklin Delano Roosevelt Presidential Library and Museum, Hyde Park, New York — In honor of the 75th anniversary of the enactment of the Social Security Act, the Works Progress Administration, the National Labor Relations Act, and the Rural Electrification Administration, the FDR Presidential Library and Museum and the Roosevelt Institute present “1935 and the Enduring New Deal,” a series of free public forums in the fall of 2010. American Institute of Architects San Francisco — San Francisco is often described as an instant city because of its abrupt birth with the Gold Rush. But like other U.S. cities, its architecture and layout have reflected to international fashions over time. Geographer Gray Brechin will examine how it did so, what keeps it unique among world cities, and how the Panama-Pacific International Exposition served as the apotheosis of its leaders' dreams of dominating the Pacific Basin and surpassing New York City in the process. Gray Brechin is interviewed about his book, Imperial San Francisco: is San Francisco as bohemian as it seems? Dozens of artists were hired by the Civil Works Administration to decorate the public spaces and staircase of the new Coit Tower at the time of the San Francisco General Strike. Gray Brechin and Peter Driscoll will show how those artists left colorful vignettes of city and country life at that time as well as pushing the envelope of what was politically acceptable in publicly financed art. We have been living for 75 years on the long-term investment in the future made by the Roosevelt administration in times harder than ours. Berkeley City Auditorium, 2050 Center Street, Berkeley. A three-hour narrated tour of labor on and around SF Bay, including work on the new Bay Bridge span. Gray Brechin and Harvey Smith will give their annual day-long bus tour of New Deal sites in San Francisco. A day-long series of evnts celebrating one of the last remaining Mechanics’ Institutes, still going strong in San Francisco. Gray Brechin will moderate a panel discussion on the rebuilding of the city after the 1906 fire at 6 PM. Visit www.milibrary.org for schedule of events. Gray Brechin contrasts the New Deal’s energetic commitment to education with current efforts to eviscerate public education. And Ross Eisenbrey describes how unpaid interns are used and abused in the private sector. Eugene, Oregon: Lane Community College, Lane County Museum, and University of Oregon. Gray Brechin contrasts the government's extraordinary commitment to education during the New Deal with current efforts to eviscerate public education. McCone Hall, U.C. Berkeley Campus. All units of California’s once model public education system are undergoing an unprecedented contraction in response to the most severe recession since the Great Depression of the 1930s. California’s Living New Deal has discovered that during the latter crisis, however, President Franklin Roosevelt’s New Deal did precisely the opposite, expanding public education in all of its manifestations from schools to libraries, museums, and teaching hospitals. That expansion did much to end the Depression and has benefitted unwitting generations for over seventy years. What has changed? Audre Lorde Room, Women's Building, San Francisco. Cosponsored by the CCSF Department of Labor and Community Studies Program and the Center for Political Education. In the 1930s, the "New Deal" Works Progress Administration created jobs for tens of thousands of artists and writers, including authors such as John Cheever, Richard Wright, Zora Neale Hurston, radio journalist Studs Terkel, and painters like Jackson Pollock, Mark Rothko and Rockwell Kent. In the 1970s, the CETA program funded artist-organizers who helped create the Cultural Centers that now exist in San Francisco's neighborhoods. Today a new movement is emerging to promote a 21st century New Deal for the arts. Jobs for Artists! will feature a panel discussion on the rich legacy of federal jobs programs for artists and writers, and build support for a larger effort timed with the 75th anniversary of the WPA in 2010. Featuring WPA historian Gray Brechin, cultural journalist Jeff Chang, and Arlene Goldbard, organizer of a May 2009 White House briefing on federal arts funding. With short readings and original performances by local poets honoring the great work of WPA-sponsored artists and writers. Gray Brechin is a Research Fellow for the Living New Deal of the Department of Geography at UC Berkeley, and the author of Imperial San Francisco: Urban Power, Earthly Ruin. Jeff Chang is the author of Can't Stop Won't Stop, A History of the Hip-Hop Generation. 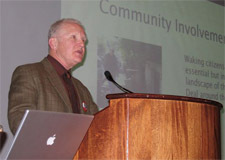 His recent article in The Nation, "The Creativity Stimulus" described the importance of public culture to social change. Arlene Goldbard is a writer, speaker and consultant currently based in Berkeley. Information about her latest book, New Creative Community: The Art of Cultural Development and other writings is available at www.arlenegoldbard.com. Friends of the Eastern California Museum Annual Meeting. Mar 16 Will We Miss the Chronicle? A conference at San Francisco City College. Join Gray Brechin and Harvey Smith as they travel through history on a bus tour of historic sites built by New Deal labor. You will learn about the major contribution workers made during the Depression era in San Francisco. The tour is sponsored by LaborFest. Acclaimed analyst and author Chalmers Johnson talks with Gray Brechin about Johnson's new book Nemesis: The Last Days of the American Republic. Discussion of Upton Sinclair’s Oil! "Julia Morgan and Her Times"
"Labor Murals in San Francisco"
"The Phoebe Hearst Memorial for U.C." "Destiny's Gunsight: Symbolism of the Golden Gate"
"Ishi Meets 'The End of the Trail'"
"Suicidal Utopias: California Cities in 1915 and Now"
"The Architecture of San Francisco"
"The World We Lost: California in 1915 and Now"
3/19/91 National School Boards Association, National Convention "Building A City On Gold"
"The Panama-Pacific International Exposition and the Palace of Fine Arts"